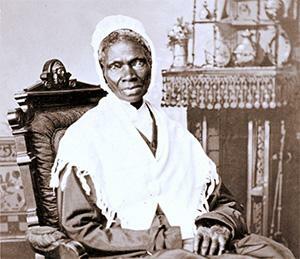 Sojourner Truth was named Isabella Baumfree when she was born around 1797 in Ulster County, New York. With her parents, she was held in slavery and prevented from receiving an education. Before the age of thirty, she had served three masters, married, and had five children. In 1827, she escaped from her abusive master. The following year, she became free under the New York Anti-Slavery Act. In 1843, she experienced a call from God to preach. Because she did not want to carry anything from her life of slavery into her life as a free woman, she changed her name to Sojourner Truth - Sojourner because she was going to travel throughout the country, and Truth because she was going to declare truth to the people. Working in the abolitionist and women's rights movements, her imposing stature, commanding personality, and captivating speaking style made her a popular speaker and one of the best known women of her time. Her speech at the Akron, Ohio, Women's Rights Convention in 1851, in the version known as "Ain't I a Woman", is one of her most influential speeches. She supported herself by publishing her autobiography, The Narrative of Sojourner Truth, which she dictated to her friend, Olive Gilbert. After the Civil War, Sojourner Truth traveled to Washington, D. C., where she worked to improve living conditions for African Americans, and to integrate the city's streetcars. She also attempted to persuade the government to set aside land in Kansas and Missouri for freedmen. In 1875, she retired to her home in Battle Creek, Michigan, where she died on November 26, 1883. One of the most important women of the nineteenth century, Sojourner Truth remains a powerful symbol of the struggle for the rights of African Americans and women. In 1981, she was inducted into the National Women's Hall of Fame. In 2009, she was memorialized with a statue in the U.S. Capitol.